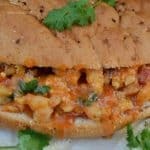 Curry Shrimp Sub is the perfect Friday night dinner or anytime weekend lunch – even kids love this mildly spiced shrimp sandwich. I have never had a Curry Shrimp Sub before recently, or rather never had curried Shrimp. I like Shrimp with a sweet and sour sauce, or something lemony.